1988 was not a good year for the Miami Dolphins. The Dolphins entered the season coming off of an 8-7 finish in the strike-shortened year of 1987 and the '88 season began with consecutive losses. Miami rebounded to win four of the next five games and arrived for their October 23rd meeting against the New York Jets with a 4-3 record. The Jets came in with a 3-3-1 record and a high-scoring offensive game was anticipated. The Dolphins would not win that day, but in a losing effort, Miami quarterback and future Hall of Famer, Dan Marino passed for a career-high. Miami grabbed an early 7-3 lead on a 45-yard touchdown pass from Marino to Mark Clayton. The Dolphins led 10-6 after the teams traded field goals, but the Jets closed the first half with 24 straight points with six coming on a Marino interception that was returned for a touchdown by Erik McMillan. Trailing 30-10 at the break, the Dolphins pulled to within seven early in the fourth quarter as Troy Stradford scored from a yard out to make the score 37-30. Turnovers however, were too much for Miami to overcome as the Dolphins fell 44-30. In the loss, Marino passed for a career-high 521 yards and three touchdowns, but also threw a career-high five interceptions that day. McMillan finished with three interceptions for New York as the Jets' defense finished the day with six total takeaways. Jets' quarterback Ken O'Brien, who was actually drafted ahead of Marino in the 1983 NFL Draft, threw for only 174 yards, but also tossed three scores and limited his interception total to one. Miami would rebound with a victory the following week against the Tampa Bay Buccaneers, but would lose the next five to fall out of contention. The Jets went on to finish 8-7-1, but missed the playoffs as well. The Dolphins went on to finish just 6-10 and in last place in the AFC East in 1988. The season was one of only two under head coach Don Shula in which Miami finished with a losing record and the only losing season with Marino at quarterback. For the remainder of the 1988 season and over the next 11 years, Marino was never able to eclipse his passing total from that late October afternoon at a place then known as Joe Robbie Stadium. But a five-interception performance and the 44-30 loss to the rival New York Jets made it an afternoon to forget. Not again until 1999, Marino's final season in the league would Marino throw five interceptions in a single game. 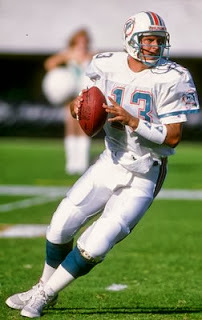 Marino went on to lead the NFL that season with 4,434 yards passing, but also tied a career-high with 23 interceptions.